Are You Going Gaga For Lady Gaga's Chickens? 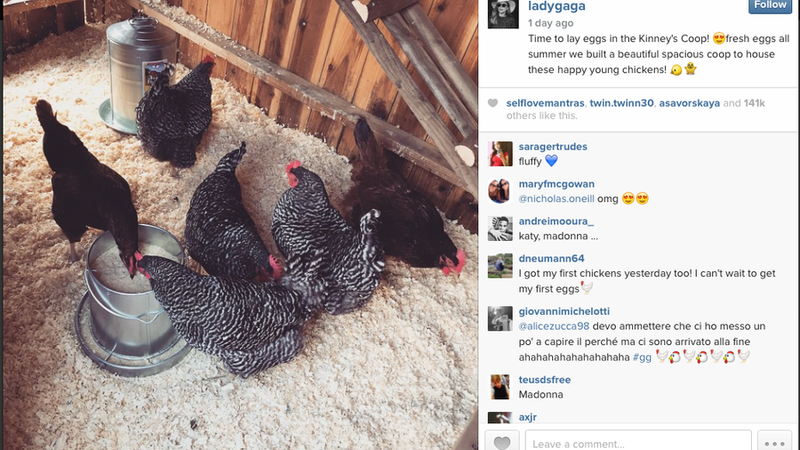 Are You Going Gaga For Lady Gaga’s Chickens? Lady Gaga, backyard homesteader? It’s true—Gagaloo has taken in six plump hens. The fact that in just one day, Gaga’s Instagram post collected nearly 150,000 likes and 2,400 comments should tell you one thing: We’re probably going to be seeing an uptick in backyard chickens. Such is the power of G.
However! Before you Gagaphiles rush out and buy a fluffy little flock, pause to ask yourself a few questions that could spare your chickens a return trip to wherever they came from. We speak from experience, having raised chickens here at Sunset for the past 8 years. Does your city allow you to keep chickens? Every city has its own rules. Our municipality (Menlo Park, California) lets residents keep hens, but not roosters. That’s fairly common in cities: Many have no problem with a few quiet hens (usually classified as pets), but they ban noisy roosters. Check your local regulations before picking out your flock. It would be dreadful to get them and then have to get rid of them. Do you have space? Each chicken should have at least 10 square feet to run around in, plus 4 square feet of house. Can you keep them safe? Making their digs secure is extremely important, especially at night. Chickens are prey, and they sleep so soundly that they seem unconscious—morsels waiting to be devoured. They are vulnerable to attack by raccoons, skunks, foxes, weasels, and other predators. Raccoons are particularly nasty, and they’re particularly clever about using their little nasty hands to get into your coop. Also, keep in mind that your other pets (cats, dogs) may be predators. What will do you with them when they stop laying eggs?Hens lay best in the first year, and may lay sporadically for four or five years, but they can live for eight years (or longer). After their prime egg-laying years are over, will you be happy to keep caring for them? What will you do if one gets injured or sick? Before you acquire your flock, and regardless of your philosophical feelings about whether your chickens are pets, you must make sure you have a plan for what to do in case something happens to one of them. If you choose to take your chickens to a vet, locate an avian vet in your area in advance, preferably one familiar with chicken health problems. Not everyone who raises chickens chooses to treat them when they get sick. Some people will euthanize a sick or injured animal; others have a friend, family mem- ber, or neighbor willing to do it in an emergency. Can you afford it? You’ll be getting good fresh eggs for free, but setting up a coop can cost a few hundred dollars, depending on the materials you use, and chicken food is an ongoing expense. If you decide to visit the vet, those bills can add up quickly. All that said, raising chickens is a joy! And nothing, nothing beats the taste of a truly fresh egg. If you’d like to read more about Sunset’s forays into chicken-raising, check out our backyard homesteading book, The One-Block Feast. It contains an entire chapter about our backyard chickens, and a lot of real-life advice.